There are a lot of activities to keep you busy while you’re here at Lake Rudolph. Between tie dye, the pool, movies, nearby Holiday World, and more … you may not have a lot of downtime. But, if you do find yourself at your site or rental with nothing to do, try out some of these fun, camping games! And don’t forget to ask your fellow campers to join in. Organize a scavenger hunt. It’s always a good stand by. This will work best if you can pair an adult and child together on the same team. Write a bunch of crazy actions on strips of paper. For example, “walk like a crab,” “do the twist,” or “sing the chorus of your favorite song.” Put each action inside a separate balloon and blow them up. Everyone should sit, facing one another, in a large circle. Play music and pass the balloons from person to person around the circle. After a few minutes, stop the music. When the music stops everyone should put the balloon they are holding in their chair and sit on it. Those who popped their balloon have to perform the action listed. Then start the music back and continue. Draw a large circle out of flour, large enough for two people to stand in. Each camper hops on one leg, holding the other foot by the ankle up at his rear. To win, you must force your opponent to lose balance and let go of their ankle, fall down, or step out of the circle. The only contact allowed is bumping shoulders – no grabbing or pushing! You’ll need two large beach towels and several water balloons. Four people play this game; two at each end of the beach towel. Start off with several feet between you. Place a water balloon in one blanket and launch it in the air. The object is for the second team to catch it without the balloon bursting. After each successful catch you should take a step back, increasing the throwing distance. It basically works like a water balloon toss; only with beach towels! Once you’re finished please make sure that you pick up the broken pieces of balloons. Again, an old standby. Have a potato, ball, or something to pass around the circle. Play music and pass the object around the circle. When the music stops the person holding the item has the “hot potato.” They are out and the game resumes until you have one winner at the end. This was one of my childhood favorites. Whether it was as we were going on a long car ride or just on vacation. One person says, “I spy with my little eye something that is (insert color).” Other members of the group take turns guessing what the object is. The person who guesses correctly wins and takes the next turn. If you’ve been looking for a seasonal position the summer then Lake Rudolph has just the gig for you. You can even choose from several different positions based on which job interests you most! We will be holding our annual job fair on Saturday, February 5, 2011, in the upper level of the Santa Claus American Legion. Stop by anytime between 9:00am and Noon CST to fill out a application and talk representatives from each department. The legion is located on Highway 245 in Santa Claus. If you can’t attend the job fair, no need to worry. You can stop by the Lake Rudolph office during regular office hours and pick up an application. 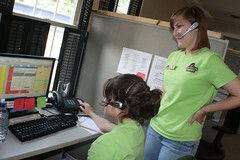 Or you can visit our Employment Page on the website to download an application. Just make sure to have the completed application returned by March 11, 2011. Hope we’ll see you at the job fair! Enjoy and be safe this winter camping season! During the winter it’s important to dress in layers so you can adjust your clothing as needed. Remember … you can always remove a layer, but you can’t put a layer on if you didn’t pack it. Adjust layers as needed to prevent sweating and excess heat. Also remember that mittens are warmer than gloves. 2. Pay attention to those feet! Your boots should have a waterproof outer shell. Something like oiled leather or plastic. Also, contrary to what people believe more layers of socks isn’t necessarily good. Too many pairs of socks can serve to restrict blood flow to your feet making them colder. Do, however, make sure that you carry lots of extra, dry socks. 3. Don’t be a hot head. Meaning, don’t lose heat through your head. Always wear a hat. Over half of your body heat can be lost through your head. A balaclava is ideal because it protects not only your head, but also your face and neck. Or use a hat and a neck gaiter. This is even more important in the winter months. Have your route in place if you’re hiking and make sure to monitor weather conditions such as temps and snowfall, etc. Remember that many things are more difficult and take twice as long in the winter. Have an emergency plan in place and know your options. It’s also a very good idea to talk with area rangers and park employees. Put the next day’s clothes in the sleeping with you during the night. This will not only ensure that you have warm clothes to slip on in the morning, but also help insulate your sleeping bag. Or even wear a hat to bed to keep from losing heat. Put on the next day’s shirt and undies. By doing this you won’t have to put a cool layer of clothes right onto your skin … you’ll start with a warm layer. At night wear lose fitting clothes so it doesn’t restrict your circulation which will make you cold. Even though it’s cold, it is surprisingly easy to get dehydrated in the winter. During the winter the air is dry and you lose water through just breathing. Make sure to hydrate often! Keep water bottles from freezing in your pack by putting them in wool socks or using an insulated bottle cover. Drink plenty of water, even if you aren’t thirsty. Instead of stopping for lunch and cooling down, eat snacks throughout the day during short breaks. This will keep you from having to adjust your layers too much as you cool down and heat back up. Eat a dinner that’s high in calories. Calories are basically heat. Take a snack to bed with you in case you wake up cold. Eat the snack and get your energy up, thus making some body heat! 9. Dry out before bed. Make sure that your clothes are completely dry before bed. Better yet … change into dry clothes before bed. Make sure your socks aren’t wet. If you know where your gear is it you can quickly located it and keep you from unpacking to find items. Arrange items in your pack for easy location. The items that you know you’ll need most … water bottles, flashlight, snacks, extra gloves … should be stored in the top of your pack for easier access.